Dr. Kathryn Henshaw was selected as an Emerging Leader and will represent Oklahoma at the upcoming AVMA Veterinary Leadership Conference in Chicago. The 2017 conference will be held at the Hyatt Regency in Chicago, January 12-14. Also attending the conference with Dr. Henshaw will be Dr. Joel Manley, President- Elect; Dr. Kelly Cooper, Vice President; Dr. Charles Freeman, AVMA Delegate; Dr. Rosemarie Strong, AVMA Alternate Delegate and Amanda Meeks, Executive Director. Dr. Kathryn Henshaw graduated from Oklahoma State University College of Veterinary Medicine in 2007. She spent 3 years as an active duty Army Veterinary Corps Officer stationed in Georgia and South Korea. She enjoyed working with Soldiers, military working dogs, and managing the clinics on base. After leaving active duty as a Captain, she returned home to the Tulsa area and joined VCA. 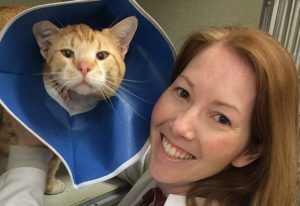 She worked at the VCA Cat Hospital of Tulsa before moving to VCA Woodland Central where she is currently the medical director. Kathryn has a strong interest in soft tissue surgery, chemotherapy, feline medicine, and staff dynamics. She is married to Scott Henshaw and they have two boys, Robert and Gabriel. She has two dogs- Daisy Duke and Diesel and one cat- Sugar. OACF Receives $20k for the Pet Overpopulation Program!